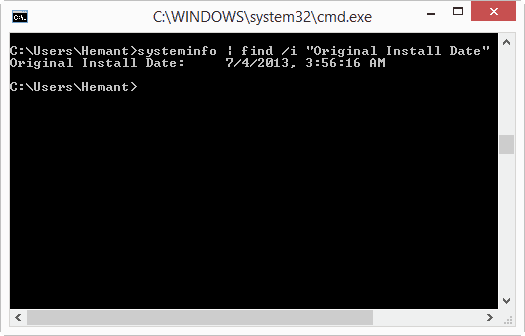 If you just want to know about the installation date of your Windows, then you can easily get it using Command Prompt. systeminfo is a command in Windows that gives you details about the configuration of your hardware and also about the operating system. It displays the security information, information about the RAM, network adapters, the disk spaces and the Product IDs. Open “Run” dialog box. This can be done by pressing Win + R on the keyboard. Now type “cmd” and hit Enter. Now type the command given below in the Command Prompt Window. This will display the Windows installation date and time. Many people suggested some other ways too, like you can check the creation date of your Windows folder, or you can check the first update in your Windows Update history. But both of these methods work until and unless you did a clean install on your system. They will show different date if you have upgraded your version of Windows. Instead of the complete command you can use systeminfo which will fetch you much more information about your system. NOTE This method is tested on Windows 7 and Windows 8. It should work on older versions too. If it fails, use the command “systeminfo” and scroll up to find the Windows installation date.